Do you often find yourself waking from a deep sleep because you became overheated during the night? This problem is more common than you might realize. Fortunately, there are products available that can help. In this guide, we’ll explain the technology behind cooling blankets, point out the differentiating features of each type, and take a closer look at some of the top-selling products on the market with our closest review of the TOP 6 Best Cooling Blankets. How Does a Cooling Blanket Work? Who Can Benefit From the Use of a Cooling Blanket? Cooling blankets are often a medical necessity, but they aren’t restricted to hospital use alone. Anyone who tends to “sleep hot” can benefit from the use of these products. They also come in handy during the summer months, particularly in regions with warmer climates. While the basic function of a cooling blanket is shared by just about every product out there, some are better suited for certain situations than others. For example, there are dog-sized blankets designed to keep your pet cool on the hottest days of the year. Others may require electricity, which would make them a poor choice if you intend to use the blanket during travel. This is why it’s important to know exactly what you’re looking for in a cooling blanket before you begin shopping for one. The technology behind cooling blankets was originally developed by NASA, to help keep astronauts cool during space travel. Today, these products are used by medical professionals to treat a range of issues (see Medical Use, below), and also by anyone who has a tendency to overheat during the night (see Everyday Use). Most cooling blankets work by absorbing the body’s heat, then releasing it back when the body temperature drops again. In these cases, the fabric itself is designed to regulate temperature through heat and moisture signals. 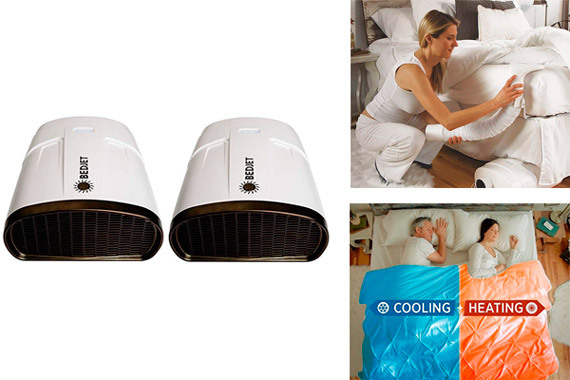 Others, like the BedJet series (see BedJet in the TOP 6 Best Cooling Blankets product review), actually have built-in climate control features, similar to an electric blanket. While the former are more convenient and portable, as they require no electricity, the plug-in versions offer versatility for couples whose body temperatures run differently throughout the night. When a febrile patient is seriously ill, medical personnel will usually attempt to bring the fever down, by any means necessary. While there are drugs available that can assist in lowering the body temperature, cooling blankets help to bring the skin temperature down as well, thereby making the patient more comfortable. It’s important not to lower the skin temperature enough to induce shivering, however, as this can raise the core temperature still further and negate the positive effects of the blanket. Cooling blankets may also be used in delivery rooms and neonatal care units, in cases where the infant’s oxygen supply was compromised during delivery. When the newborn’s core temperature is lowered to 91 degrees during the first six hours of life, its tiny body requires less energy to function. This allows the entire system to slow down, potentially protecting the brain from greater damage. This process takes place over a period of 72 hours, after which the infant’s temperature is raised to normal once again. As mentioned above, the technology used in modern cooling blankets was originally developed by NASA, in an effort to ensure that the astronauts remained comfortable during flight. Originally, the suits were cooled through the use of chambers that pumped liquid throughout the inner core of the suits, but by the 1980s, NASA was experimenting with the development of fabrics that could regulate temperature. without the involvement of fluids. This is known as “phase change technology”, and it works by integrating the temperature-controlling elements into everyday fabrics. Many women in this phase of life are prone to hot flashes, which can cause significant discomfort. A cooling blanket can help keep this annoying symptom at bay. Menopausal women don’t have a monopoly on abrupt swings in body temperature. Many people tend to “sleep hot,” which can lead to frequent waking. Keeping the temperature regulated during sleep is a good first step toward managing the symptoms of these disorders. Getting a good night’s sleep is important for everyone, but if you suffer from depression or frequent panic attacks, it can make a highly positive difference. While these products are often used in the medical industry, many are crafted out of the same fabrics you’ll find on just about any bed. The exceptions are listed below, along with explanations on the positive and negative factors of each type. Outlast is the name of the company responsible for developing the microencapsulated phase change materials (mPCMs) that have been so beneficial to the space program. Called “Thermocules,” these materials work by changing from solid to liquid and vice versa, as excess heat is alternately absorbed and released. Since they can be used to either heat or cool the body as needed, mPCMs can be found in everything from blankets to jackets, to winter boots. 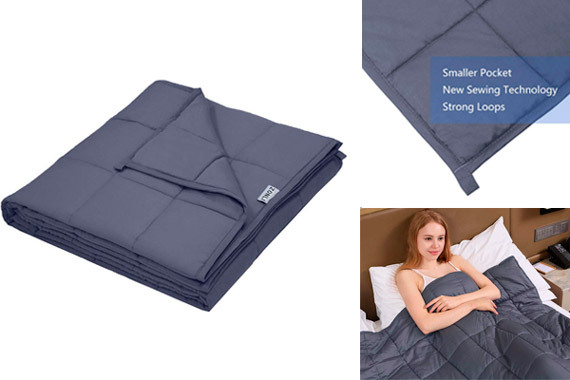 These blankets incorporate the use of additional weight to help the user feel more “secure,” and therefore more comfortable when trying to fall asleep. Individuals with tactile issues—for example, some people on the autism spectrum—could benefit from the use of these blankets, as they provide a therapeutic alternative that’s drug-free. Note that this isn’t a one-size-fits-all cure; in fact, people with certain disorders might feel that the added weight is too restrictive. These units keep the bed cool with the aid of electricity, rather than stand-alone technology. As a result, they tend to be much colder than the competition, which could be either a positive or a negative, depending on your perspective. Since they need to be plugged in, they aren’t the most versatile choice, but this might not matter if you plan to only use the blanket at home. The cooling blankets designed for pets tend to use a water-based and pressure-activated gel to keep the animals from overheating. Since dogs and cats are (mostly) covered in fur, their responses to the mPCMs would differ greatly, making the technology far less effective. 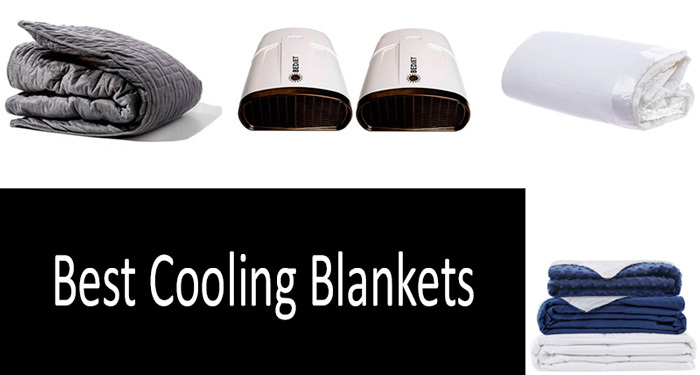 There are many factors to consider when shopping for a cooling blanket. Fortunately, all of the specific considerations should make narrowing down your choices that much easier. How much can you afford to spend? Are you willing to shell out a bit more for a blanket that’s more durable and/or effective? What will the blanket be used for—therapy, fever management, or everyday use? Is it safe for you to use a cooling blanket? Do you have any complaints, physical or otherwise, that would be exacerbated by any particular type? Who is the blanket intended for—an adult, child, elderly individual, or pet? Find out which products are geared toward which age group, if any such designation is provided. In this section, we’ll take a look at six of the top-reviewed products on the market, providing technical information and feedback on each one. This blanket utilizes PCMs to help regulate body temperature. It’s lightweight and breathable, suitable for year-round use. The fill is comprised of 50 percent Thermocules, 50 percent polyester fiber, while the shell is 100 percent cotton with a thread count of 300. Available in a variety of sizes and colors. Testers have praised the Outlast blanket, claiming that it works exactly as advertised to provide a restful and comfortable night’s sleep. The few detractors complained mainly of issues unrelated to the cooling function–receiving the wrong size, for example. The NASA connection makes this product especially attractive to buyers who might be skeptical of the technology. This can be easily recommended to anyone who wants a blanket that regulates temperature without weighing you down.. This product offers “deep touch pressure simulation” in the effort to help people with stimulation issues achieve the night’s sleep that they deserve. It’s available in weights of 15, 20, and 25 pounds; your choice should depend on the weight of the individual who’ll be using the blanket. The exterior is woven out of ultra-soft microfiber, and it’s detachable from the internal blanket, which utilizes stitching to keep the temperature-regulating beads in place. Both the exterior and the interior are machine-washable. Available in several colors. Customer response to the Original Gravity Blanket has been mixed at best. While its weight does help to promote a restful night’s sleep, it’s reportedly too small to cover even a full-sized bed. Further, the stitching doesn’t always work to keep the beads in place, which leads to shifting and results in lumps in the blanket. 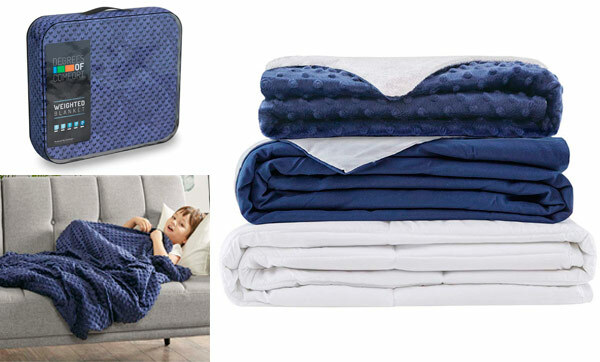 If you’re looking specifically for a weighted blanket, this might be worth a second look; otherwise, try another product on our list. The YnM’s outer shell is crafted of 100 percent natural bamboo, containing a blend of polyfill and tiny glass beads that work to absorb body temperature. As with the Original Gravity Blanket, you should check the weight chart carefully to ensure that you select the right size for the individual in question. YnM also offers a three-year warranty against damage. 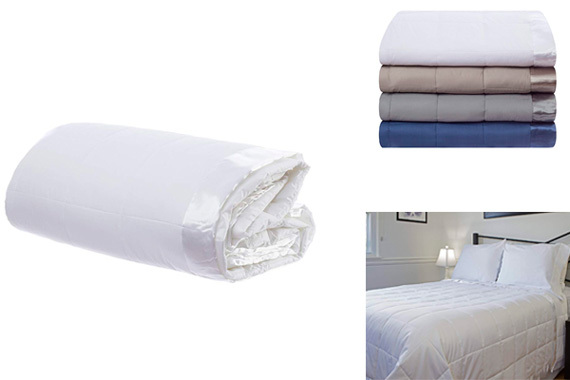 Note that the outer duvet cover and the inner layer are sold separately and that while the cover is machine-washable, spot cleaning is recommended whenever possible. Available in a variety of colors. People who’ve tried the YnM report good results across the board. A handful of testers were battling conditions such as Restless Legs Syndrome, and while the blanket doesn’t claim to provide relief, the testers claimed that their symptoms did improve while using it. It’s also heavy enough to offer stimulation to tactile-sensitive users. It should be noted, though, that both components should be purchased if you’re looking for a cooler night’s sleep–the inner layer alone may retain too much heat without the bamboo to provide wicking. Overall, the Y2M has enough good qualities to warrant a high recommendation. This blanket is crafted of 100 percent breathable cotton, which makes it one of the most durable and versatile on the list. There are two layers of microfiber on the interior to help keep the temperature-regulating beads from shifting during use. Not recommended for pregnant women or children under the age of 5. A number of colors and sizes are available; you should choose a blanket that’s roughly 7 to 13 percent of your own body weight (or that of whomever will be using the blanket most). This product comes highly recommended by testers, a number of whom suffer from panic attacks, post-traumatic stress disorder, sleep apnea, and the aftereffects of traumatic brain injury. It’s heavy enough to provide comfort, but not so heavy that it becomes too hot. 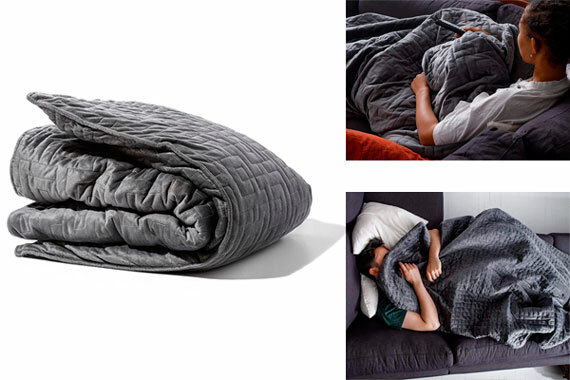 This is another weighted blanket on our list, but it’s essentially different from the others because it features both cooling and warming properties. It includes two duvet covers: warm fleece to keep you toasty through winter and CoolMax microfiber to ventilate heat away from your body during hot summer. The additional weight brings calming qualities and helps battle stress, features appreciated by everyone. 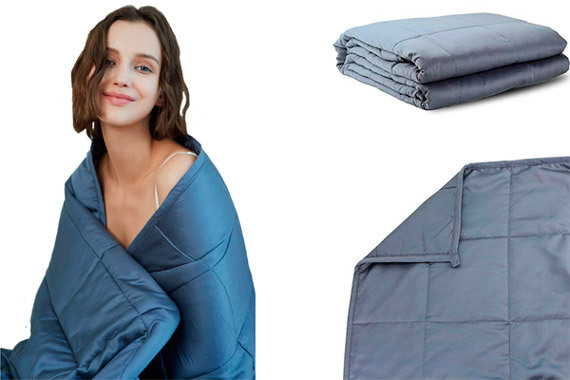 Anti Gravity Blanket, as the manufacturer calls it, is a decent choice among weighted blanket, considering it’s affordability and good positive feedback. Almost everyone liked the purchase, some even saying that it was a life-changer. Those whose lives were not changed, though, said they would prefer something of a bigger size. Unlike the other products on this list, the BedJet uses powered ventilation to provide a cooling effect. In fact, users can choose between heating and cooling functions–even from within the same bed, thanks to its dual-zone technology. The BedJet gets solid reviews from testers, even those who live in exceptionally warm climates and who tend to sleep hot anyway. The biggest concern faced by most of them was the sticker shock: Since this is as much an appliance as it is bedding (it can even be connected to your wireless device via Bluetooth), it’s much pricier than most of the products on our list. Nevertheless, if you’re looking for a blanket that can both warm you up and cool you off, this could be just what you’re looking for. What does “cooling blanket” mean? These are blankets designed to bring down body temperature. They may also be used in post-operative therapy or to treat injuries. How do you use a cooling blanket? For the most part, cooling blankets are used in the same way as regular blankets. The exceptions are usually related to the medical industry (see below). Sometimes, when a newborn has been deprived of oxygen during the labor process, a cooling blanket will be used to lower their body temperature in an effort to prevent brain damage. They can be used to bring down fever, to provide relief from burns and minor injuries, or simply to contribute to a cooler night’s sleep. What is the best temperature for a cooling blanket? While temperatures can range from 38 to 85 degrees Fahrenheit, 40 degrees is a good rule to live by. The answer can vary, based on your individual needs. For ideas, see the TOP 6 Best Cooling Blankets, above. When should you use a cooling blanket? You can use one of these blankets whenever you feel uncomfortably hot, particularly when trying to fall asleep. Is there a cooling blanket you can use when you have a high fever? Yes, there are hypothermia blankets that are designed specifically for this use. The general-use cooling blankets listed above may also help to reduce the effects of fever. What’s the best cooling blanket to use in the summer? Any of the top products listed in the TOP 6 Best Cooling Blankets would be suitable, but for summer, it’s probably best to choose a more lightweight option. Is there a good cooling blanket available for hot flashes and night sweats? All cooling blankets can provide relief from these symptoms. What’s the best cooling blanket for camping trips? For obvious reasons, it’s best to select a blanket that doesn’t require the use of electricity if you plan to take it camping. A smaller, lightweight blanket would probably be the better choice here. Medical professionals will sometimes rely on the types of blankets listed above, but there are some that aren’t suitable for everyday use. Most of these require the use of electricity and/or external refrigeration in order to work. Yes, there are “ice blankets” available for keeping large quantities of food at a safe temperature. These provide a solid alternative to ice, as they’re neater and reusable. Is there a cooling blanket for a car seat? For children’s car seats, try investing in a light, breathable material. For the regular seats, there are a number of cooling pads available. The answer depends on your own preferences. Some need a heavy blanket in order to feel comfortable; others would be satisfied with a lighter layer. See the Product Guide to determine which one would best suit your needs. What is a cooling blanket for the deceased? In cases where an individual’s remains have a bit of a wait before they can be transferred to the mortuary, there are cooling systems available that can help preserve their integrity. The blankets designed specifically for heat stroke are designed to cool the body while allowing ventilation to freely escape. Usually, blankets are placed both above and below the patient. Select the right size and weight for your body type. Use the blanket as needed–if you don’t “sleep hot” in the winter, save it for the summer. Don’t use the cooling blanket as a substitute for medical care if you suspect a serious problem. Keep the blanket as flat as possible when not in use to keep the contents from shifting. We hope you’ve learned enough about the different types of cooling blankets to make an informed decision, and that your purchase brings you comfort for years to come. If you enjoy the effects of the blanket but feel that it’s not quite enough, you might try taking a look at some of the other products on the market, such as cooling accessories for your mattress or pillowcase. Best of luck, and sweet dreams!